and really not completing much of anything. I've made some progress in our living room. We painted it and the mantle before we moved in and I basically haven't touched it since. I've had no vision for this room so it has been blank for close to a year. All of a sudden I'm overflowing with ideas (but not cash) and am trying to make it look like we've actually lived here for more than a week. Aka. warm and welcoming. There are still a lot of projects I want to do but for now this is one thing I've completed. I got this end table for free and it was just what I needed. All wood (glass top + littles running around = no bueno) and a drawer for tv remotes. but the dark just didn't fit in my living room. Especially with my chocolate brown furniture that will not be getting updated anytime soon. I sanded and painted it with 3 coats of semi-gloss latex paint. 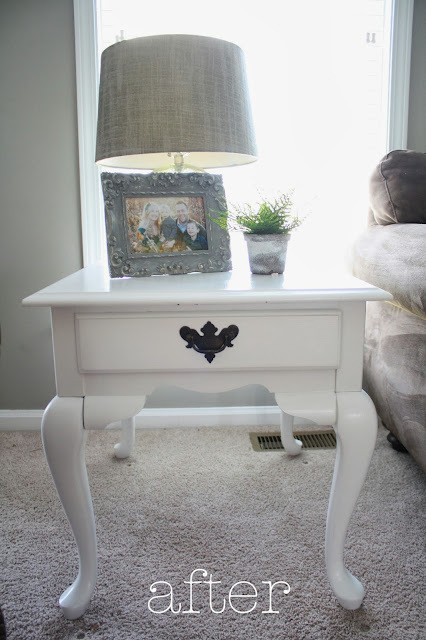 now that we have all white woodwork and I can't stop painting things white. I didn't distress it cause I knew my family would add their own and they didn't disappoint. There were already a few chips by the time I got around to photographing it. I saw this lamp at hobby lobby and fell in love instantly then waited for it to go half off. I decided I liked the original hardware but the shiny brassy gold wasn't workin' for me. and then "aging" it with some black acrylic paint, wiping it off as I went. This little project motivated me to finally make some summer pillows too...in September. but recently added a little lamp that didn't sell in my garage sale this past spring. 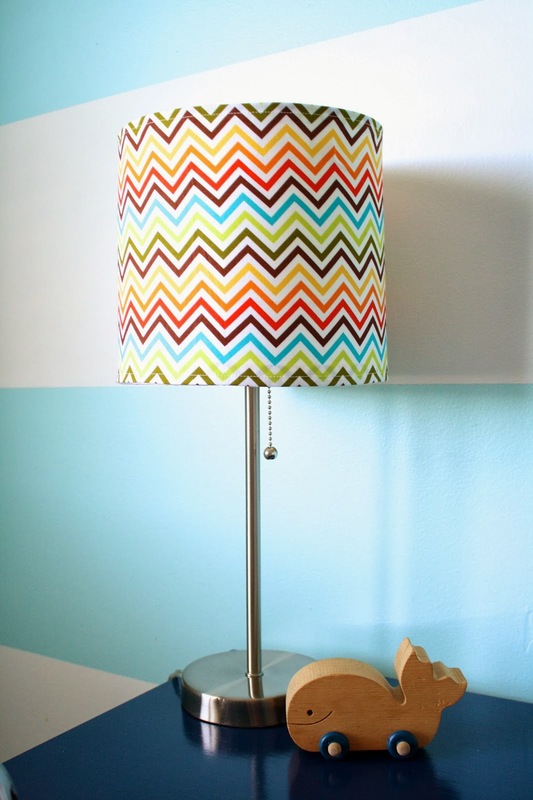 so I covered the shade with bright chevron fabric. and enough length to overlap the ends a bit. Then I pressed and hemmed all the seams. 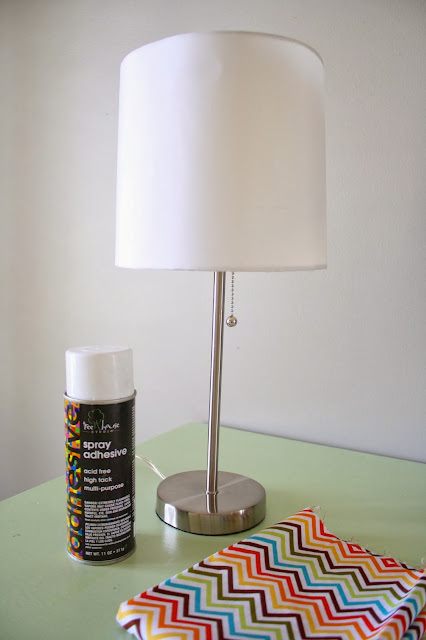 and then overlapped and hot glued the ends at the back of the lamp. and love looking at it every day. I bought it years ago when I was still trying to figure out "my style". I knew it fit it but I could never find a place for it in our old home. and cut it down to fit this frame I already had. My beloved spoon easel is from anthropologie. And now its time to get busy on fall! Love all of your re-dos- I wish I was more crafty!! Oh my… that lamp!! We recently bought an awesome lamp but the shade was a very plain creme. I was thinking to paint it knowing that usually doesn't come out great. Now I have the perfect plan! !